Using a field input mask might seem like one of those things that you might not want to ever use a whole lot but, the reality is that using a masking capability can actually prove to be quite useful in a lot of different situations. For the purposes of getting you started, we'll be taking a look at two different scenarios. For the first scenario let's look at this one using a simple TextBox field so go ahead and add one to your form right now if you haven't already. 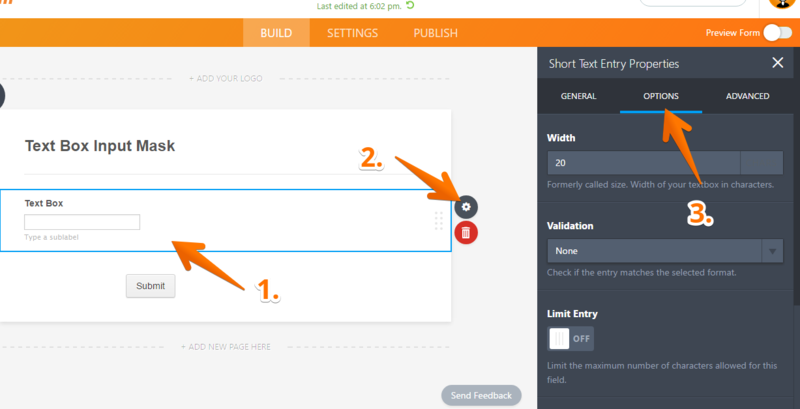 If you are using JotForm Version 4 form builder, follow the screenshots below. Select the text box field, click the gear icon and open the "Options" tab. Scroll down and find the "Input Mask" option, make sure to enable it. You'll notice right away three different symbols mentioned and these masks are pretty much as stated for each of them. 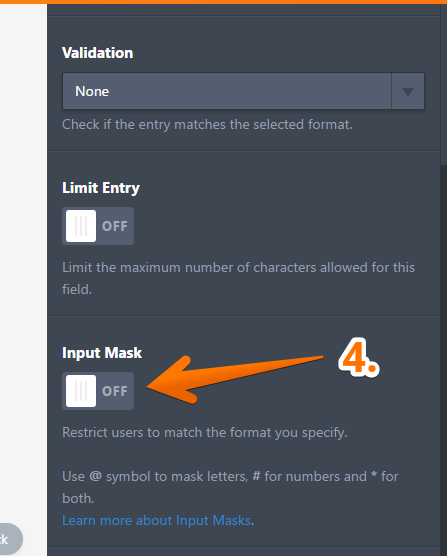 To explain the above in a simplified manner the Input Mask basically gives you much greater control over what is entered and therefore limits your users to, however, you have setup your masked characters. That might sound a bit confusing still so let's break this down even further by taking a look at these examples below. In this example lets say for instance you want to name cities that start with "St" (Saint) such as "St Augustine" which would look like this "@@ @@@@@@@@@". Now let's take a glance at this in another instance where you might want to show a set of spaced out numbers which would show up like this "# # # # #". A good use for the Numbers Mask would also be for advanced custom dates where you might not want to use the standard date fields such as "##/##/####". Both the above are good and all, but what if you needed something more than that, but didn't need that much information such as in an instance where you only want just the street address of where someone's business is located. So in this particular case, you would want to combine the above by using both @ and # together and that could look something like "#### @@@@@@@@@ @@". Also, don't forget that you can additionally allow either of these, but still control yet limit this with the third option using the * (asterisk) and that would look a bit like "*** ** **** ** ***"
But what if none of the above was good enough for your situation? What if you work in the Government, Legal, or even a Car Parts Company? You can do that too by compartmentalizing your characters to create something systematic such as "#@-#**#-#@". Now, with that out of the way giving you a basic grasp of masking on text boxes let's take a different approach at looking at this another way using the second scenario for a Phone Field. Sure, using the masking capability is handy but what if you're a phone directory provider searching for 1-800 numbers to list or you have users with foreign phone numbers and such? Instances like this are where input masking on a phone field would be useful just as much to give you control over how your phone numbers are entered and used. For the first example, let's start again but this time around add a phone field. You should be able to access the "Input Mask" option the same way we described earlier in this guide. You'll notice this time around you can only use a Number Masking with # and you will also see the default phone number input change from two inputs to one input which is additionally prepopulated with "(###) ###-####"
Now for using this for 1-800 numbers with a phone number, you could make it something like "1-(8##)-###-####" to let your users know that's the type of info needed. As another example let's say you're planning on running an outreach call program in Australia and you'd need to gather phone numbers limited to that formatting so for this it would end up looking something like "+(##)#########" but, you can format it to any country if elsewhere. So anyway, we really hope this helps to clarify everything when using Input Masking. Feel free to play around with this option. If you have any suggestions, concerns or questions, feel free to comment below or post a question on our forum page. Is there anyway I can achieve this? Is there a number format function for either the 'short text entry' field or the 'number' field to achieve this? I want to use a mask but i want to put 15 # but some may only need to use 9 #. The form is requring all 15 to be filled out. Is there away around this. How about adding ! to force uppercase? Brilliant explanation - thank you. It saved a question to the forum. How do I add a mask for an extension to a phone field - e.g. (###) ###-#### x### - where the extension may be a different number of digits each time? What masking scheme can I use for a text field that must start with "--" or "rue" ? Coo criar uma máscara de letras para que todas fiquem em maiúsculas? How can I make it so the user can only add the last 4 digits of a social security number? When they type in the last 4 digits only, numbers on the screen turns into a # but in the email you can see the last 4 digits. What if the reply can be either 3 or 4 digits? i.e. number 999 vs number 1000? Is there a way to force the first letter of a name capital? You should be able to access the "Input Mas" option the same way we described earlier in this guide. None of the available masks provide for a mixture of Alphanumerics as well as Special Characters in different positions. Hello, is there a way that if field A = x than field B can only contain positive numbers? Thanks! I agree with @dragoe about enabling Regex for more advanced users. It is definitely NOT a difficult feature to enable since you can pretty much give us direct control over the *pattern* attribute of the input field, which is pretty much plain RegEx. The input mask does not require that the values you provided are filled. In other words, I want 11 numbers and provide 11 # in the mask. The user can enter less than 11 and move forward. We need to restrict the input to 11 numbers, no more, no less. Have you considered input masking with RegEx? Of course your audience is at a higher level, but it would be very helpful to have a mask that allows any number of specified characters in a precise format. For instance by combining a name into a username such as "first.last@example.com"
Great product so far. Will definitely recommend to friends in the IT realm and beyond. Thanks! Thank you for your help I have fixed it now. I receive applicants from two different countries: Hong Kong (###)-######## and Philippines (##)-##########. Do I need 2 phone inputs or does this have the flexibility to get either in one entry? Using this method for people to register their bank account details. There is a method to limit the number of characters, but there is no method to provide a minimum. Is there another way around it? All this fine but what if , in a numerical field of 3 char I want to accept only numbers < 250 ? I need restrict entries to a particular format With there entries starting in numeric and ending in alphanumeric. But i need to keep the string length variable. how can i do that? I need the users to fill in description of goods in the following format. (Variable length Numeric Value) (Alphanumeric String of variable length). 10 X 40 Conts 50000 ctns black pepper. Is there a way to set a mask to take all these variables into account? It would be really useful is there was a way to allow for different character totals... for example, I tried to use it for Twitter profile URLs but they can be a range of lengths after the twitter.com portion. Is this doable? I am looking to delimit each entry with a delimiter recognized and selectable by Google Spreadsheets. In this way I can have the fields spread across a row as required. I'd imagine there might be a better way, but for now I might just end each field with a semi-colon, and key on that as a delimiter. Is there a better way to have the output emailed in a comma delimited (CSV) format? Thanks - and I'm new. Is there a way to force all Upper Case so the data looks cleaner. Some people use all caps and some don't. I would like to force a consistent way, one way or the other. In a masked entry I need to enter a number, if the length is less than 10 digits, I should fill with zeros to the left, I have entered the format ##########, to make sure they are just numbers, But I do not know how to make it fill with zeroes to the left, can you help me? I want to make a field in the form automatically place a "$"in front of the numbers a user is able to input but I don't want to put a limit on the numbers they can enter, as I don't know what dollar amount they will input. Is this possible? Is the message that pops up in red editable,if so how. I'm trying to make sure that people's text matches "City, State" how do I do this? I suugest you to implement more masking symbols: you strict input even not allowing user to leave number w/o decimals. For example, Microsoft (possibly) uses 3 number mask symbols for nubers: 0, 9 and #, where 0 stands for 1-digit obligatory input, 9 for 1-digit optional input and # for any digits or +/- sign input. So, for example, if one needs non-empty currency input into numeric field, the mask is "#0.99", "(999) 000-0000" for phone number with optional area code etc. When someone submit form to enquire, the alignment was not properly tabulated. See example below.